- the execution of the automatic tare and the enabling of the automation through its dedicated outputs: the dosages start at maximum speed. 2. Once the speed change threshold is reached, the dosage is slown down through the dedicated output. 3. When the TARGET is reached and the configured flight weight is missing, the slow dosage output is disabled and then it waits (for the configured time) for the dropping of the material. 6. Complete unloading request, through enabling of dedicated output. 7. End dosage or automatic restart for following cycle. 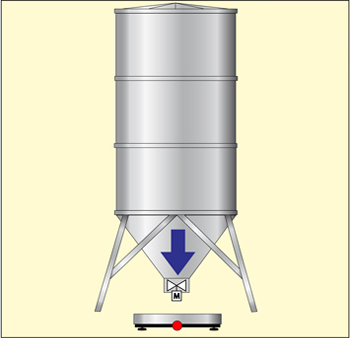 Configuration which allows to manage a dosage system in loading of a single product, useful for filling hoppers, silos or big bags, or guiding the operator in the manual dosages. Database of 40 formulas with target, speed change threshold, flight, +/- tolerance and minimum tare and maximum tare values. Quick introduction and selection of the dosage data, only for models with numeric keyboard. Automatic management of the download through any dedicated contacts. 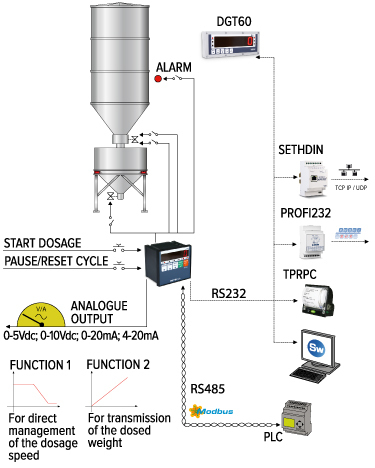 Selectable dosage mode between automatic or guided manual. Checking of the tare presence at the dosage start; the tare values are programmable for each formula. Check of the maximum dosage time. NOTE: it is advisable to use a three-light control box (available upon price estimate) in order to ease the dosage operations, in which the yellow light indicates insufficient weight, the green light indicates the target weight, and the red light indicates too much weight. - the execution of the automatic tare and the yellow light turns on (*), in other words, the request of material is made. 2. When the weight is again within the lower tolerance level, both the yellow and green lights turn on (*). 3. When the weight is equal to the configured target, the yellow light turns off and the green light remains on. 4. If the weight is within the upper tolerance level, both the green and red lights turn on (*). 5. If the weight is over the upper tolerance level, only the red light remains turned on. 6. When the weight is again within the set tolerance levels, the operator gives a start impulse in order to continue with the complete unloading of the scale.